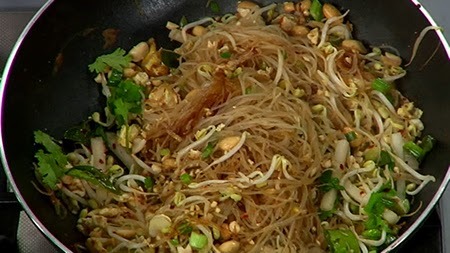 Soak the rice noodles in warm water for 20-30 minutes. Drain and set aside. Slice spring onions. Chop garlic cloves. Heat oil in a deep non stick pan, add spring onions and garlic and sauté for 2 minutes. Break eggs into the pan and stir till well scrambled. Add noodles and stir well. Add salt, Thai fish sauce, soy sauce, lime leaves, tamarind water, crushed red chillies, pickled white radish (radish cut into strips and pickled in vinegar and water) and bean sprouts. Stir gently. Chop spring onion greens and add along with sugar and ¼ cup water. Mix well. Add ¼ cup roasted whole peanuts and crush the remaining and add along with few coriander leaves and mix. Serve hot.